Three people are dead and at least 33 injured after a series of violent clashes erupted at a white-nationalist rally in Charlottesville, Virginia, on Saturday. 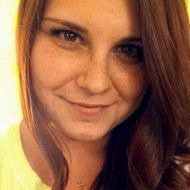 In the most extreme incident, 20-year-old white nationalist James Alex Fields plowed his car into a group of counterprotestors, killing one person, 32-year-old Heather Heyer, and injuring 19. Fields has been charged with second-degree murder, and the Department of Justice announced a civil rights investigation into the incident. 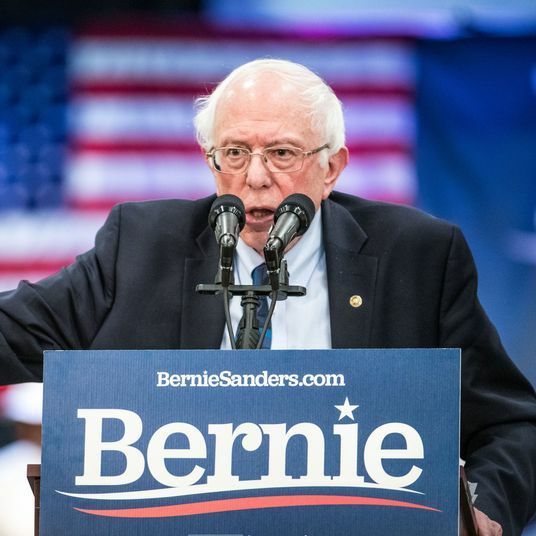 Two state troopers were also killed when their helicopter, which had been assisting with the police response to the rally, crashed outside the city later in the day. 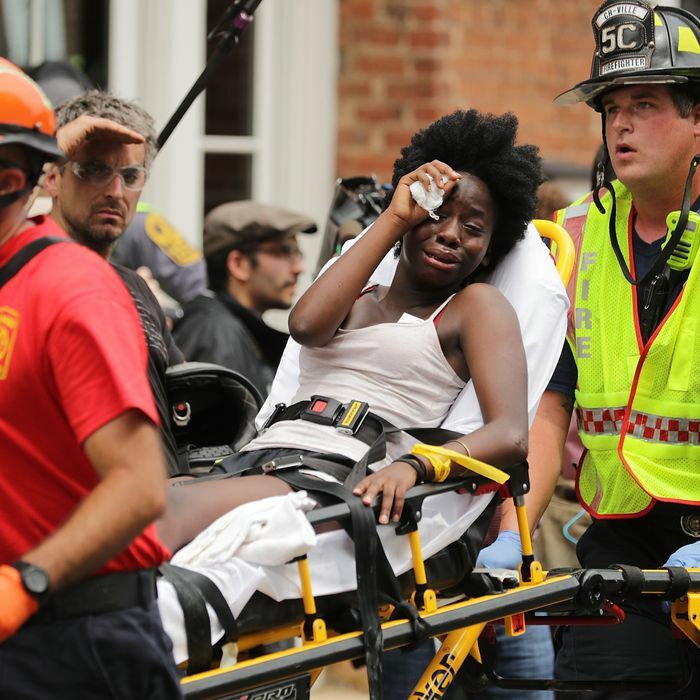 The violent clashes in Charlottesville injured at least another 14 people beyond the car attack, and led Virginia governor Terry McAuliffe to declare a state of emergency late Saturday morning. President Trump also spoke out against the violence, though not the rally, in a tweet and in an afternoon statement to reporters. Below is an overview of what we know — and don’t know — as of Sunday morning. A 32-year-old woman was killed in the collision and another 19 people were injured — including five critically. Many are already calling the incident an act of domestic terrorism, but it was not originally known if the driver acted out of panic or malice. His motive is still not confirmed, but he has been charged with second-degree murder, among other crimes related to the incident. 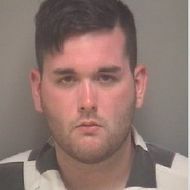 Authorities say they have arrested a 20-year-old Ohio man James Alex Fields Jr. and charged him with second-degree murder, three counts of malicious wounding, and failing to stop at the scene of a crash that resulted in a death. He was arrested after fleeing the scene of the collision with protestors. Authorities have not identified him as the driver of the car used in the attack, but that car was registered to a man of the same name and age. Fields is being held without bail and will be arraigned on Monday. It is not yet confirmed why Fields crashed into the protestors, but more details emerged about him over the weekend. He apparently lives in Maumee, Ohio, near Toledo, and the Toledo Blade reports that, according to his mother, he was in Charlottesville to attend the white-nationalist rally, though she said she didn’t know much about it. She said that she tried to “stay out of his political views,” but that he had dropped off his cat so he could go to an alt-right rally in Virginia. “I thought it had something to do with Trump,” she told the Blade. They had moved to Ohio from Kentucky last year, and James had moved out of her apartment five-to-six months ago. Buzzfeed News additionally reports that a Facebook page that appeared to belong to Fields featured posts showing alt-right memes, making references to Nazism and white supremacy, and indicating support for President Trump. Fields was also photographed holding symbols of the Vanguard America white supremacist group on Saturday, but the group denies they had any ties to him. A lot of boys get interested in the Germans and Nazis because they’re interested in World War II. But James took it to another level. He researched everything and had an intellectual argument for all his points, which is something you just don’t see that often. There are definitely students with these kinds of thoughts and feelings … but normally if you present them with an intellectual argument, they can see both sides. But James was definitely different. Fields registered as a Republican last year and voted in both Ohio’s primary and last year’s presidential election. It also appears that Fields served in the U.S. Army for about four months in 2015, but left for reasons that are not yet clear. The FBI announced on Saturday night that they were opening a federal civil-rights investigation into the hit-and-run. 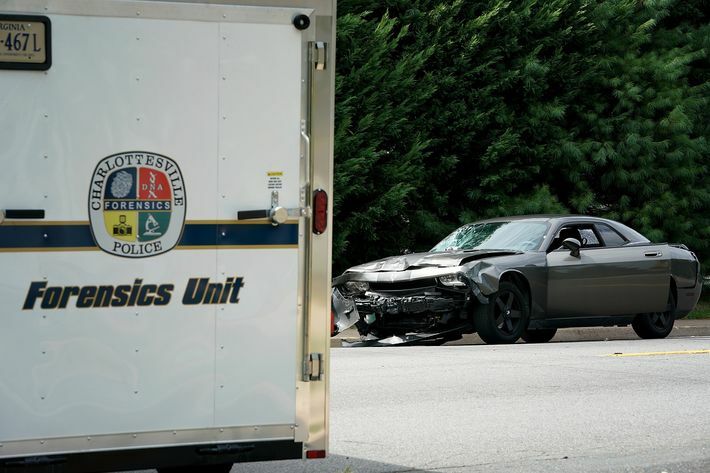 A 32-year-old Virginia woman, Heather Heyer, was killed in the hit-and-run. She was struck while crossing the street. She worked as a paralegal in Charlottesville, where she also lived. She came to the rally as a counterprotester on Saturday. Heyer’s mother also gave a heart-wrenching interview to HuffPost about her daughter’s activism and charity, and expressed her sorrow over whatever led her daughter’s alleged murderer to do what he did. For more about Heyer and how her friends and family are remembering her, head here. 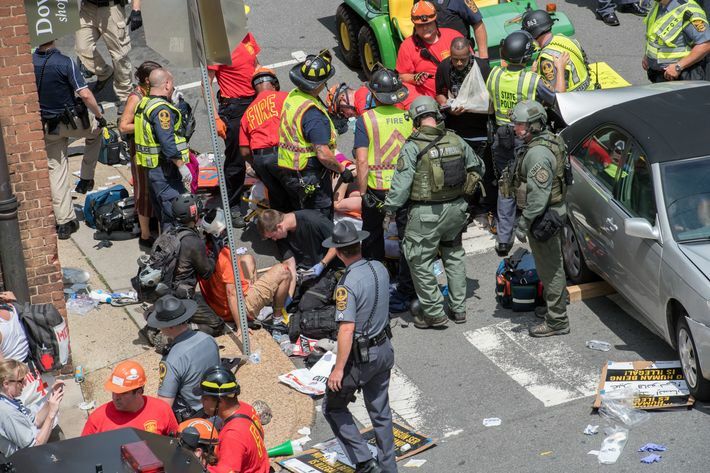 The University of Virginia Medical Center reports that another 19 people were injured when the car plowed into the crowd, including five people who were admitted to the hospital in critical condition. It is not clear if they were all counterprotestors or not, but it seems likely that most of them were. None of those victims, or any of the other injured, have been officially identified. Fourteen more people were injured in clashes throughout the day, but little is yet known about them except that none experienced life-threatening injuries. Two state police officers were also killed in a helicopter crash on Saturday afternoon. The violent clashes and car-ramming attack were not the only tragedies to strike Charlottesville on Saturday. Late in the afternoon, after the unrest had been quelled, two state troopers were killed when their helicopter crashed near a golf course about seven miles southwest of the city. The helicopter had been conducting surveillance on clashes in Charlottesville. Authorities are still investigating the cause of the crash, but the men killed in the crash have been identified as 48-year-old H. Jay Cullen and the pilot, Berke M.M. Bates, who was one day shy of his 41st birthday. A major white-nationalist rally had been planned for Saturday in Charlottesville. Organizers hoped to mount the largest white-nationalist rally in decades, and was focused on the idea that the assembled would “take America back” and protest the upcoming removal of a statue of Confederate icon Robert E. Lee from Charlottesville’s Emancipation Park (which was formerly known as Lee Park). Hundreds of white nationalists, including neo-Nazis, members of the Ku Klux Klan, and other white-supremacist groups, descended on the city on Friday and Saturday, many carrying flags with swastikas and other racist logos and chanting Nazi slogans like “Blood and soil!” Rally attendees, carrying torches, also marched across the mostly empty campus of the University of Virginia in Charlottesville on Friday night. The white-nationalist rally also attracted counterprotestors, and when rally attendees attempted to march in Charlottesville on Saturday morning, they were met by those protestors, leading to violent clashes. As Charlottesville’s The Daily Progress reports in detail, some people on both sides of the conflict came ready to fight, armed with weapons and wearing defensive gear. They hurled rocks and other projectiles at each other, swung clublike weapons, and reportedly released pepper spray and other substances into the air as cops initially stood back. The Daily Stormer, a popular neo-Nazi website, encouraged rally attendees to bring shields, pepper spray, and fascist flags and flagpoles. A prominent racist podcast told its listeners to come carrying guns. “Bring whatever you need, that you feel you need for your self defense. Do what you need to do for security of your own person,” said Mike “Enoch” Peinovich on The Right Stuff podcast. Because of the escalating violence, Virginia governor Terry McAuliffe declared a state of emergency at about 11 a.m., and police ordered the rally attendees and counterprotestors to disperse or face arrest. They were able to evacuate Emancipation Park, but clashes continued throughout the city during the dispersal. 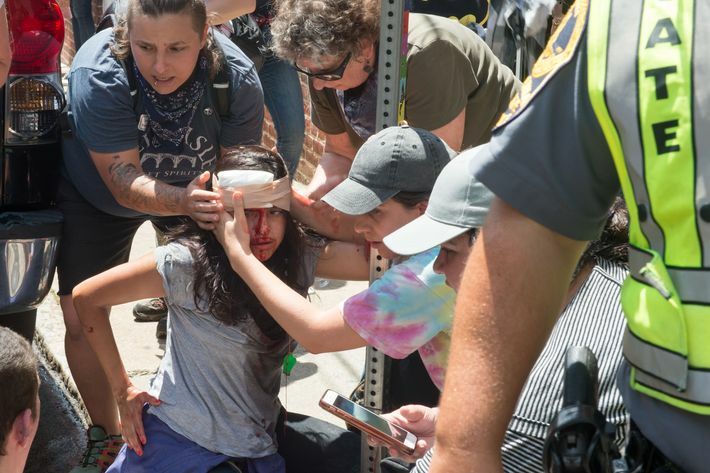 In all, it appears that at least 14 people were admitted to University of Virginia Medical Center for injuries sustained in the street clashes, in addition to the 19 people who were injured and one person who was killed when a car rammed into counterprotestors, which occurred after the rally was mostly broken up by police. 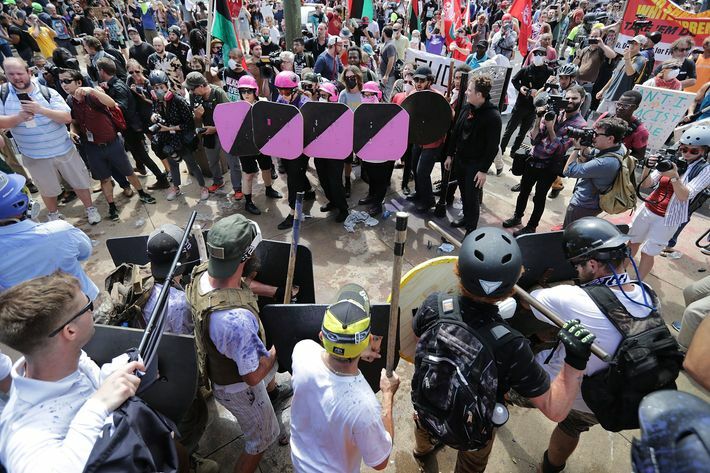 Charlottesville authorities are already being criticized for their delayed and inadequate response to the rally, their restraint after things starting going haywire, and their general inability to prevent the ensuing violence. ProPublica reports that despite weeks of detailed planning by officials on how to handle the event, “[I]t appears that the strategy was to avoid direct confrontations with the protesters,” and that didn’t work at all. Complicating the dynamics was the fact that several dozen groups of armed militias — men in full camouflage toting assault-style weapons — were in the middle of the crowds. Some claimed that they were there to keep the peace, although none appeared to try to stop the skirmishes. Other reports indicate some of the militia-types did more than the police to break up fights, at least in the beginning. The Department of Homeland Security, as well as White House Homeland Security advisor Tom Bossert, then offered their assistance to McAuliffe and local authorities. On Saturday afternoon, before a scheduled event related to veterans’ health care, President Trump first gave a statement to his press pool about the violence in Charlottesville. In those remarks, he condemned “this egregious display of hatred, bigotry, and violence” on “many sides,” and seemed to try to distance Saturday’s events from his presidency. Trump’s oddly worded tweets and statement, which conspicuously didn’t mention white nationalism or neo-Nazis, was not surprising given his long history of hesitating to speak out against white-on-minority violence, despite his willingness to condemn a lot of other things. Such an omission also aligned with his administration’s apparent priorities: In June, the Trump administration dropped DHS funding for a group dedicated to de-radicalizing white-nationalist extremists. President Trump also offered his condolences, via Twitter on Saturday night, to the families of the woman who was killed in the car incident, as well as the two state troopers who died in the helicopter crash. Republican leaders quickly spoke out, but did so much like Trump: issuing anodyne (and in Mitch McConnell’s case, confusing) statements that failed to address why the rally in Charlottesville was taking place, and which seemed to take a “both sides” approach to the violent rioting. This post has been updated throughout to reflect new details about Saturday’s events.